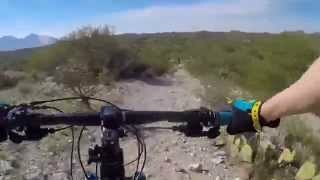 Dry - Great flowy trail, get going to fast and you might end up in some cactus. Look for a few little side trails to test your tech skills/add some small rock faces. Dry - some cacti come a bit close, but not overgrown. Dry: no markers, entirely overgrown. trail not distinguishable anymore. Climbing the Wild Burro Trail. Starting the Ridgeline Trail descent. Switchback climb coming up to get atop Ridgeline. Gila Monster on Ridgeline trail. Cristate saguaro visible from the trail.